Post Planner is a system designed to enhance the social media marketing activities and campaigns of any business. Using this software, social media marketers find it easy to manage and share content consistently, and are able to achieve predictable, measurable, and remarkable results with their social media posts, especially on Facebook and Twitter. 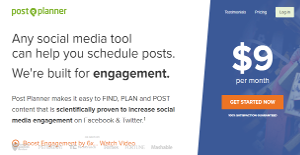 A platform created by social media marketers for social media marketers, Post Planner aims to get more engagement and reach on social media in the less amount of time. Every interaction with a user is treated as a data point used in constantly improving the service overall. Post Planner provides information on the top performing content for any social account, hashtag, or topic that you can use in your social media marketing campaign, all ranked by virality so that you can confidently predict engagement on your content. All such content can be put in one location, adding at the same time accounts from Facebook, Twitter and Instagram, and your favorite hashtags, keywords, and blogs. You can then choose the best content to enhance interaction with your audience. Post Planner’s star ratings help you choose the most engaging content available, and promise up to 650% more engagement than any social media marketing tool. In addition, the platform provides engagement metrics that matter for all posts to Facebook Pages and Twitter. You can sort your posted content by important engagement metrics too. This helps you decide which content to Re-Post or cross-pollinate to other social profiles in seconds. Post Planner also offers a built-in post scheduling to choose a specific time and date to publish. If you have content that you wish to reuse or share again, there is the Re-Cycle feature to revive your best evergreen content and keep it feeding into the social eco-system again and again if needed. Every company has different requirements and needs an application that can be customized for their size, kind of staff members and buyers, and the specific industry they are in. For these reasons, no software can offer perfect features off-the-shelf. When you look for a software app, first be sure what you need it for. Read some Post Planner reviews and ask yourself do you want basic tools or do you need sophisticated features? Are there any industry-specific tools that you are seeking? Find the answers to these questions to help your search. There are multiple factors that you need to consider and these include your budget, particular business needs, your organization size, integration requirements etc. Take your time, use a few free trials, and finally select the app that offers all that you need to improve your firm effectiveness and productivity. How Much Does Post Planner Cost? Post Planner is available in scalable pricing plans for small businesses and enterprises. We realize that when you make a decision to buy Social Media Monitoring Software it’s important not only to see how experts evaluate it in their reviews, but also to find out if the real people and companies that buy it are actually satisfied with the product. That’s why we’ve created our behavior-based Customer Satisfaction Algorithm™ that gathers customer reviews, comments and Post Planner reviews across a wide range of social media sites. The data is then presented in an easy to digest form showing how many people had positive and negative experience with Post Planner. With that information at hand you should be equipped to make an informed buying decision that you won’t regret. What are Post Planner pricing details? What integrations are available for Post Planner? If you need more information about Post Planner or you simply have a question let us know what you need and we’ll forward your request directly to the vendor.